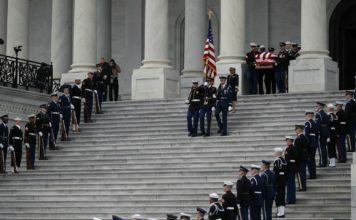 George Herbert Walker Bush, the 41st president of the United States whose long life in the public sphere was defined by service to his country, has died. He was 94. 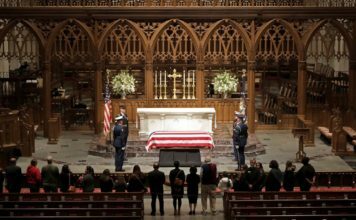 His wife of 73 years, Barbara Bush, died in April and Mr. Bush was hospitalizedthe day after the funeral to be treated treated for an infection in his bloodstream. He suffered a number of health issues in his later years, including vascular parkinsonism, a condition similar to Parkinson’s disease, and used a wheelchair to get around. On June 12, 2018, Mr. Bush celebrated his 94th birthday with family members in Kennebunkport, Maine, becoming the first U.S. president in history to reach that age. “I see history as a book with many pages, and each day we fill a page with acts of hopefulness and meaning,” he said in his 1989 inauguration speech. For Bush, the first chapter of that book began in Milton, Mass., on June 12, 1924. His was an elite world of private schools and public lives. For the son of Prescott Bush, a successful banker-turned-Republican senator, the sky was the limit — and he took to it. On his 18th birthday, he enlisted in the Navy, becoming the youngest fighter pilot in World War II. He flew 58 combat missions, including one that nearly ended his life. “I knew that if something didn’t pick me up, I would be captured,” Bush said. He returned from war with a Distinguished Flying Cross and a bright political future. A year later, he was hard at work at Yale University and courting the young woman he met at a Christmas dance. In January 1945, he married Barbara Pierce. They said it was love at first sight. “I think he’s the wisest, smartest, most decent, caring person I know, and I think he’s the handsomest thing I ever laid my eyes on,” Barbara Bush once said. Together they left the East Coast and headed south to Texas, where both the oil business and a family were booming. Together George and Barbara had six children. Robin, their first daughter, died in 1953 of leukemia. She was not yet 4 years old. Six years later, another daughter, Dorothy, was born, joining sons George W., John Ellis (known as Jeb), Neil, and Marvin. It also marked a rebirth for Bush as well, as he embarked on a new career in politics. After a contentious 1980 primary season and a failed bid for the presidential nomination, Bush’s opponent, Ronald Reagan, surprised the party by choosing Bush as his running mate. As the 41st president of the United States, George Herbert Walker Bush was inheriting a rapidly changing world. The Berlin Wall had fallen; the communist empire was disintegrating; and in Panama, American troops rooted out a corrupt regime, overthrowing Manuel Noriega’s government. But the battle with Saddam Hussein had just begun. When Iraqi forces invaded Kuwait, President Bush assembled a global coalition, waging an air and ground campaign known as Operation Desert Storm. Kuwait was liberated in just six weeks. President Bush didn’t order U.S. troops to press on to Baghdad, fearing a long guerilla war. “George Herbert Walker Bush was the finest foreign policy president the United States had after Harry Truman. And I don’t say that lightly,” said historian Brinkley. On the campaign trail for reelection in 1992, Bush would face not one but two opponents: Democrat Bill Clinton and Independent Ross Perot, who would both hammer home the notion that Bush was out of touch with the problems of everyday Americans. 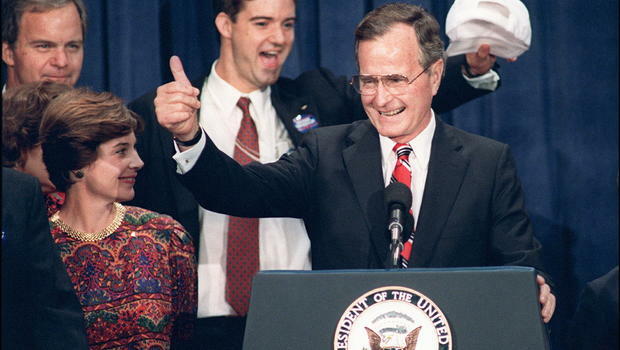 “Read my lips … no new taxes,” Bush famously promised as he accepted the presidential nomination in 1988. Bush had won a war, but lost the election. After leaving the White House, the former fighter pilot would take to the sky once again, jumping from planes to celebrate birthdays, and travelling around the world on them with another former president, Bill Clinton. Together, the two would raise millions for victims of Hurricane Katrina and a devastating tsunami in southeast Asia. Once political foes, the two men forged a deep and lasting friendship. “People say now that they can’t tell the difference between me and President Bush anymore and, oh yes you can. I’m the one who has more gray hair,” Clinton joked. Bush’s son George would serve as the governor of Texas and two terms as president, while another son, Jeb, became the first Republican governor of Florida to serve two full terms.